DA Form 260-1 - also known as the "Request For Publishing - Da Training, Doctrinal, Technical And Equipment Publications" - is a United States Military form issued by the Department of the Army. 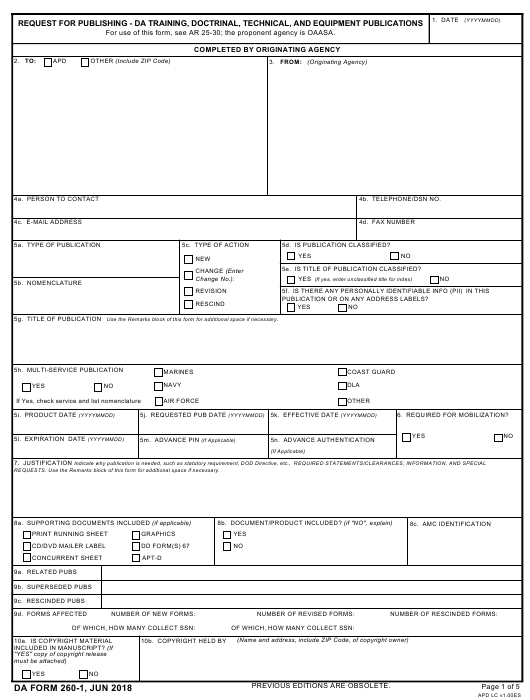 The form - often mistakenly referred to as the DD form 260-1 - was last revised on June 1, 2018. Download an up-to-date fillable PDF version of the DA 260-1 down below or look it up on the Army Publishing Directorate website. For use of this form, see AR 25-30; the proponent agency is OAASA. 5e. IS TITLE OF PUBLICATION CLASSIFIED? PUBLICATION OR ON ANY ADDRESS LABELS? Use the Remarks block of this form for additional space if necessary. REQUESTS. Use the Remarks block of this form for additional space if necessary. 12a. UPON PUBLISHING, IS THERE ALSO A PRINTING REQUIREMENT FOR THIS PUBLICATION? DESIGNATED GENERAL OFFICER (GO)/SES INCLUDED? Use the Remarks block of this form for additional coordination, if necessary. 14f. ARE YOU ATTACHING A SEPARATE LIST OF YOUR POINTS OF COORDINATION? 17a. APPROVED IN ACCORDANCE WITH AR 25-30. 3. FROM. Enter the name and address of the originating agency (including address and nine digit zip if available). 4a. PERSON OF CONTACT: Enter the point of contact (someone qualified to answer questions about the publication submitting for publishing). 5a. TYPE OF PUBLICATION: Select the type of publication (e.g., TM, TB, MWO, etc.) from the drop down list. block 14, Remarks. For IETMS, include the EM number in this block along with the publication number. 5c. TYPE OF ACTION: Select the type of action (e.g., new, changed, revised, or rescind). 5g. TITLE OF PUBLICATION: Enter complete title of the publication. should indicate all the services that are using the publication by selecting the boxes beside the names of services. 8a. SUPPORTING DOCUMENTS INCLUDED: Select all that apply for the publication. 9b. SUPERSEDED PUBLICATIONS: Enter the publication numbers and dates for any publications being superseded by this publication. 9d. FORMS AFFECTED: If applicable, enter information about any forms affected by the publication. distribution statement from the pop-up menu. If further restrictions such as FOUO apply, this information can be entered in the space provided. 11c. DISTRIBUTION MEDIA: Indicate how the manual will be distributed. Select all that apply. 11d. INITIAL DISTRIBUTION NUMBER: For DA publications that are printed an Initial Distribution Number (IDN) will be assigned to that product. Enter the assigned IDN if known. 14a THROUGH 14f. : Not applicable for technical and equipment publications. Leave blank. 16a. TYPED NAME OF AGENCY HEAD: Enter the name of the head of the Agency who is proponent of the publication. 17c. TYPE NAME OF PUBLICATION CONTROL NUMBER: Enter the name of the Equipment Publications Control Officer (EPCO). 18a THROUGH 18d. APPROVING AUTHORITY: Not applicable for technical and equipment publications. Leave blank. attach additional sheets as needed to the DA Form 260-1.